Alana Riley – Who&#39;s Afraid of Red, Yellow, and Grey? Who’s Afraid of Red, Yellow and Grey (2009-2010). HD Video still. Blu-ray disc, 16:9,1080p, 2min. 17 secs, looped To be presented on a flat HD screen (50”) vertically mounted to the wall. Who’s Afraid of Red, Yellow and Grey? 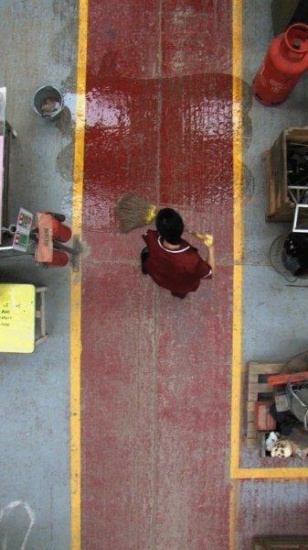 (2009-10) is a single-channel, single-shot video loop of a bird’s eye view of myself mopping the long passageway of the National Sculpture Factory, where I was an artist-in-residence. This video (and title) makes reference to colour-field painting, specifically Barnett Newman, and serves as an exploration of the actions of an artist in a studio space, as well that of everyday work and labour. During the time of my residency, I was reflecting on the workplace of the “artist’s studio”, and the weight of its’ history, specifically towards the mediums of painting and drawing. This piece serves as an analogy to painting; with the mop as my paintbrush. My traditional “worker” uniform was chosen to match the floor, and the buckets and mop also further adhere to the monochromatic reference of the work.